FIVE FINGER DEATH PUNCH REMEMBER EVERYTHING LYRICS"
Please forgive me, I can't forgive you now. Would that change the end? 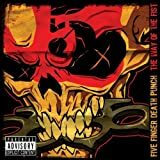 All Five Finger Death Punch - Remember Everything lyrics are property and © copyright of their respective owners. All Remember Everything lyrics provided for educational purposes only.